For several decades, there has been some interest in the relationship between vitamin D and the development of multiple sclerosis (MS). One of the previous theories regarding the higher incidence of MS in the northern latitudes was that there was a corresponding deficiency in vitamin D attributed to the lack of UV exposure. Multiple sclerosis is a disease caused from the immune system that produces anti-bodies which attack white brain matter and the sensitive linings of the nerve fibers. The symptoms of MS include visual disturbances, numbness, tingling, weakness, and difficulty balancing. Although the exact relationship between vitamin D and the development of MS has been previously argued, some new research may be able to clarify this issue. Recently, researchers have found that patients who are newly diagnosed with MS should have their blood levels of vitamin D evaluated. According to the results of this new study, patients who were in the earliest stages of MS and had the lowest blood levels of vitamin D were more likely to experience a greater degree of disease progression and symptom severity. The study also indicated that these same patients could successfully decrease the severity of these symptoms by taking supplements containing vitamin D.
This study analyzed the data from 465 patients suffering from MS who had previously enrolled in a drug treatment trial. The researchers looked at the relationship between the blood levels of vitamin D in the patients and the progression of their disease over a five-year period. 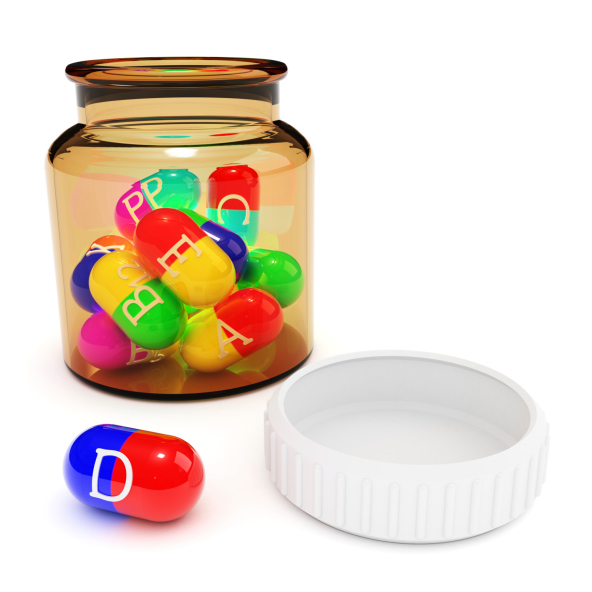 What the study authors found was that the patients who had normal blood levels of vitamin D experienced a 57% lower risk of developing new sclerotic brain lesions compared to patients whose levels of vitamin D were inadequate. In addition, patients who had adequate blood levels of vitamin D also experienced a 57% reduced risk of symptom relapse and had a 25% lower risk of developing new brain lesions each year. The subjects who had normal levels of vitamin D were also less likely to suffer reduced brain volume compared to those who had inadequate blood levels of vitamin D.
Low vitamin D levels are very common in the general population because the typical diet consumed in North America is relatively devoid of the foods which contain the highest amounts of vitamin D. These include cod liver oil, oily fish, and foods fortified with vitamin D. In addition, more people are avoiding direct contact with sunlight and this is a very important human source of vitamin D. Vitamin D can be produced from the human body by direct conversion of UV light with the skin. Considering the fact that the recommended daily amount of vitamin D is 600-900 IU and few people can attain this intake without the use of supplements, vitamin D supplements may be a good step to take. Although lower blood levels of vitamin D have been associated with the development of osteoporosis, colon cancer, diabetes, and heart disease, in my opinion, its effect upon the disease of MS should not be disputed. “Boosting vitamin D could reduce severity of multiple sclerosis,” Harvard School of Public Health; http://www.hsph.harvard.edu/news/press-releases/boosting-vitamin D-could-reduce-severity-of-multiple-sclerosis, last accessed February 18, 2014. Ascherio, A., et al.,“Vitamin D as an Early Predictor of Multiple Sclerosis Activity and Progression,” JAMA Neurol. Published online January 20, 2014.